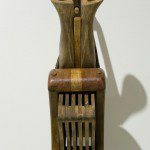 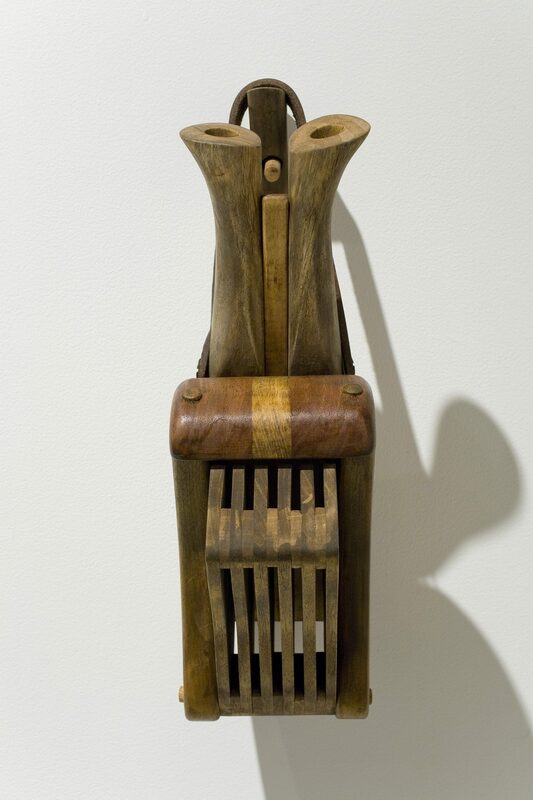 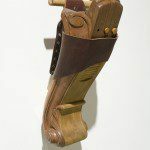 Since his first exhibition at Galerie Art Mur in 2003, Guillaume Lachapelle has continued to manifest the absurd and unexplained in his intricately carved small wooden sculptures. 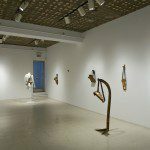 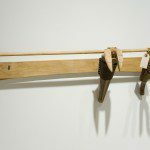 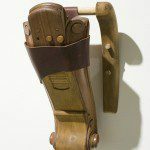 This new series of sculptures is markedly different, incorporating the possibility of mobility by making these new works wearable art objects. 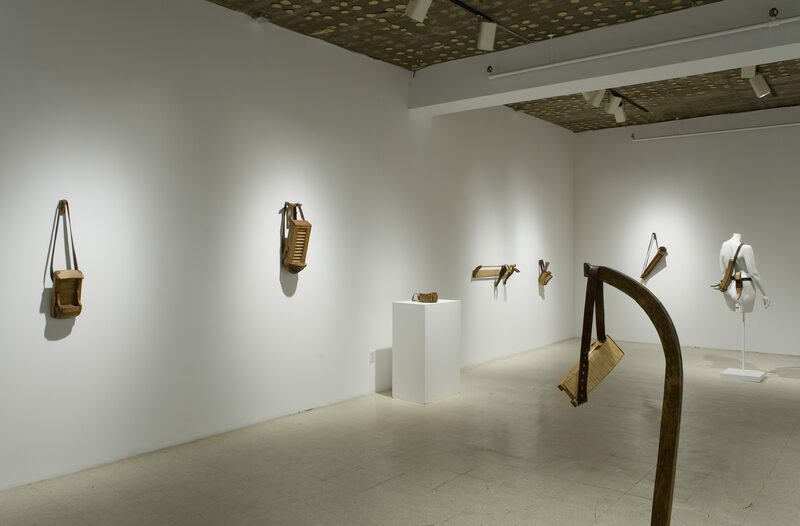 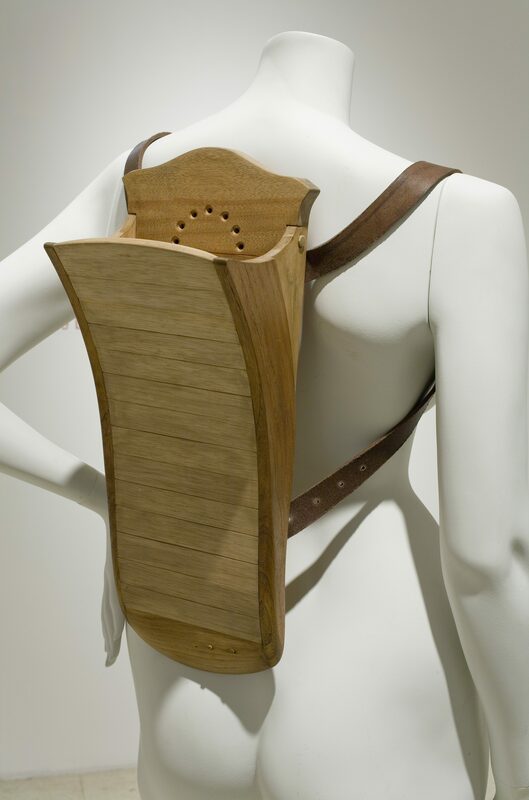 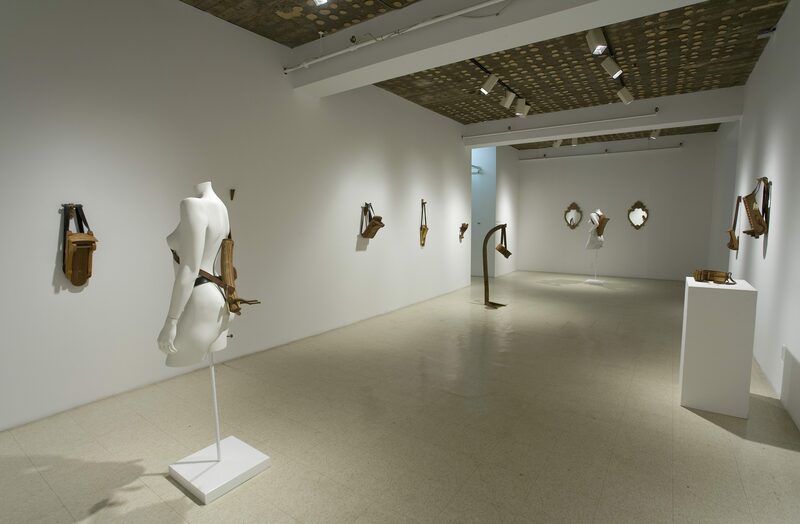 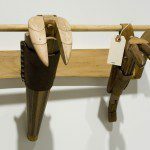 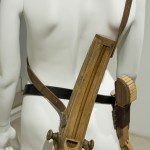 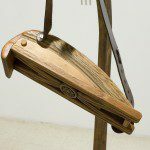 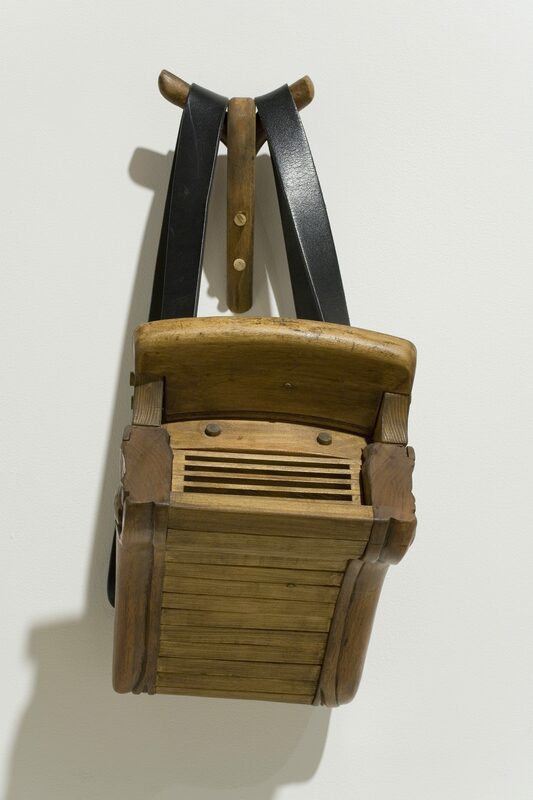 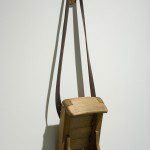 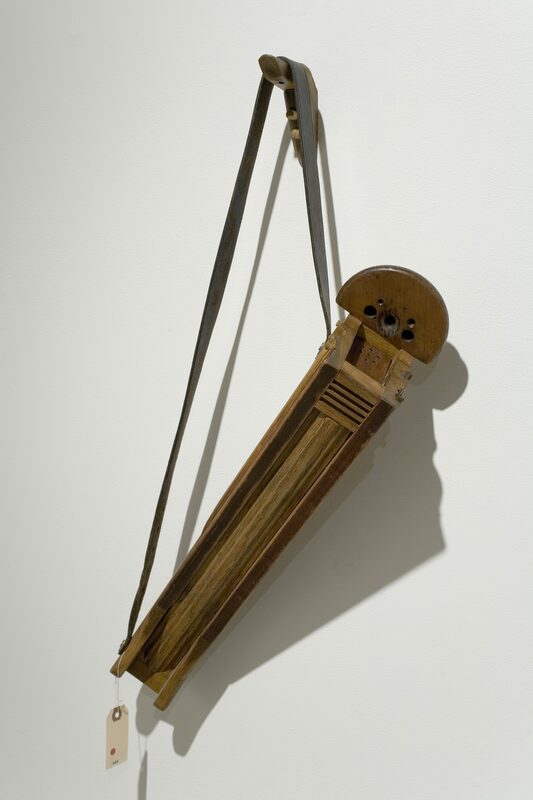 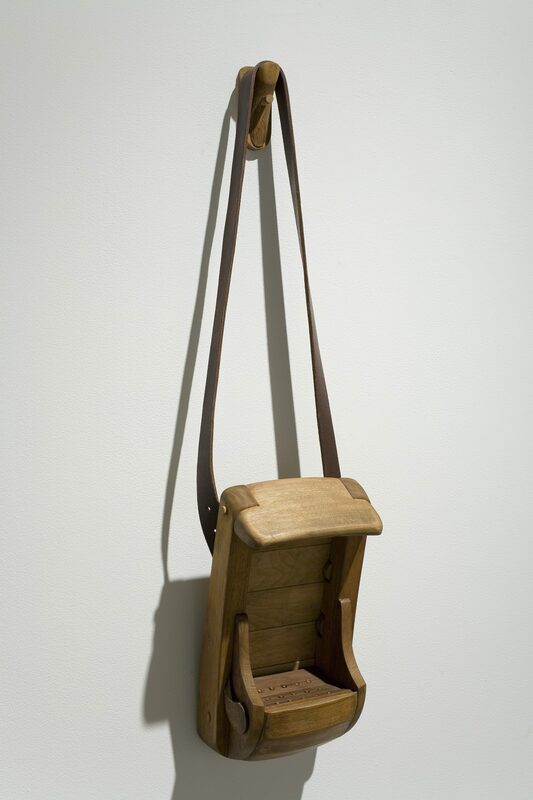 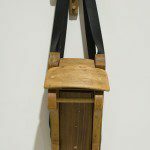 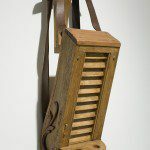 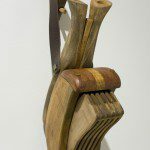 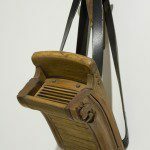 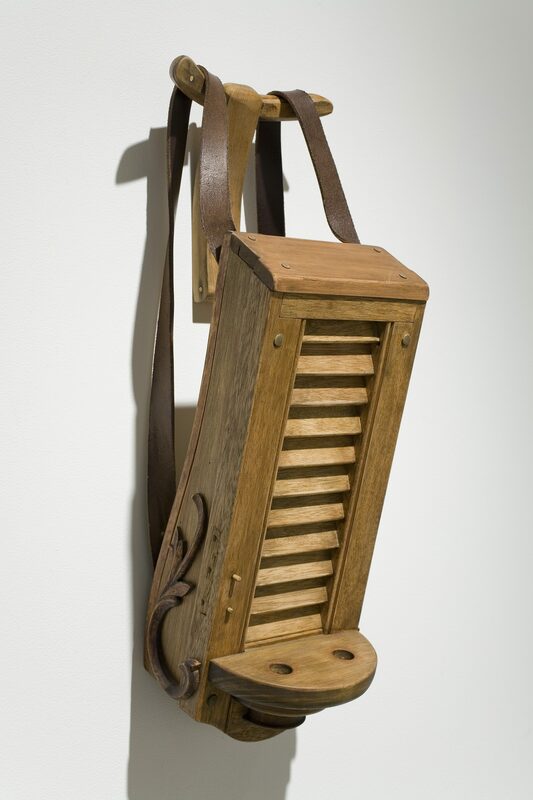 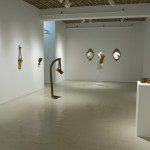 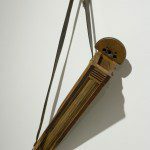 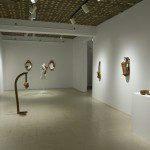 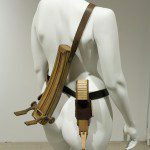 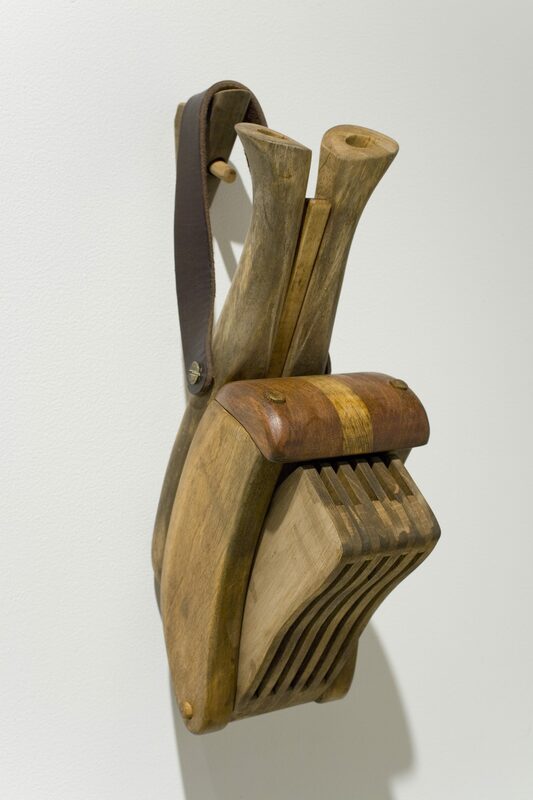 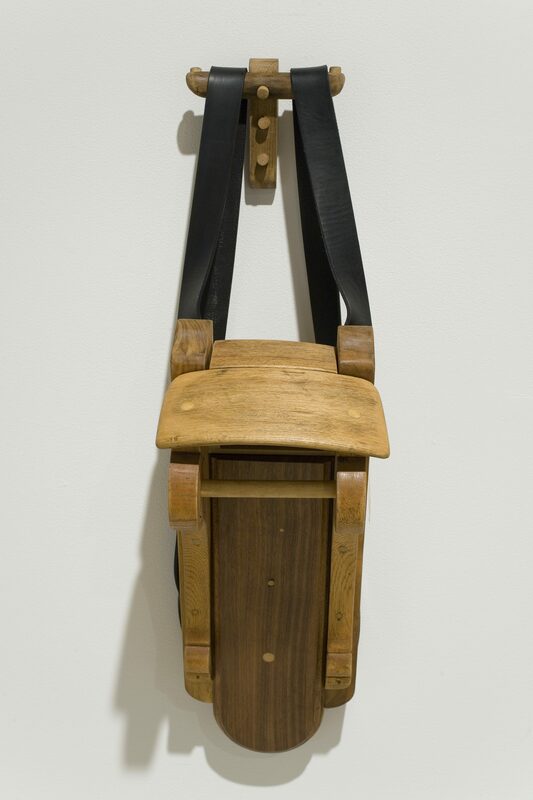 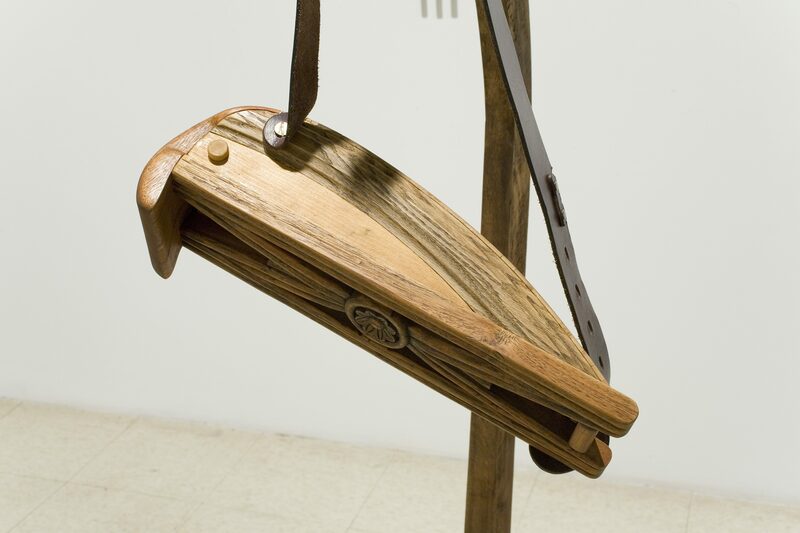 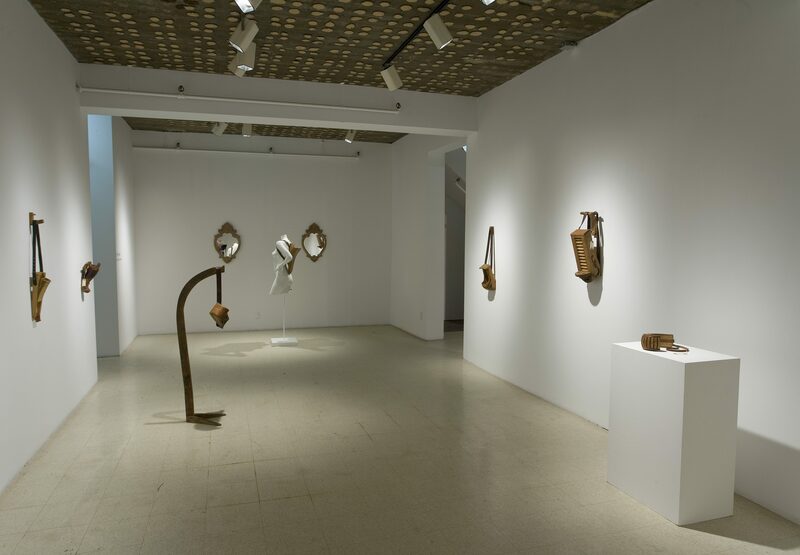 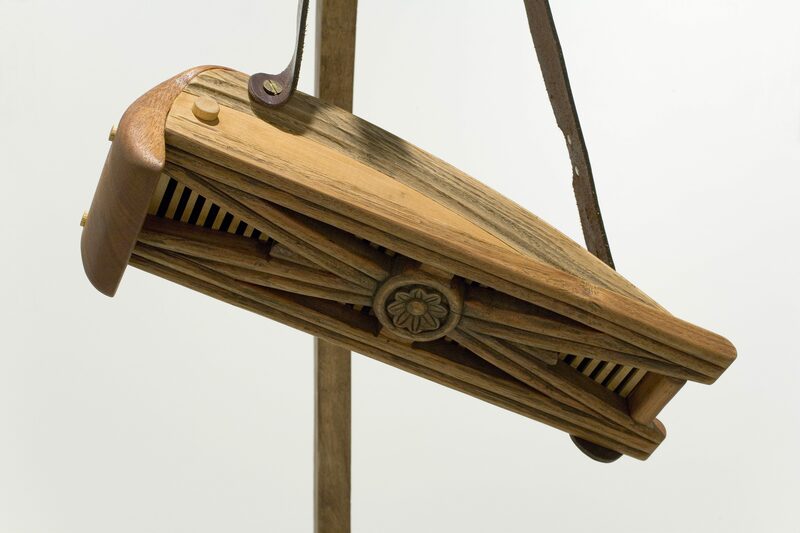 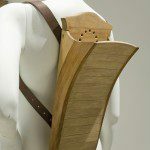 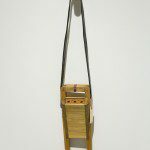 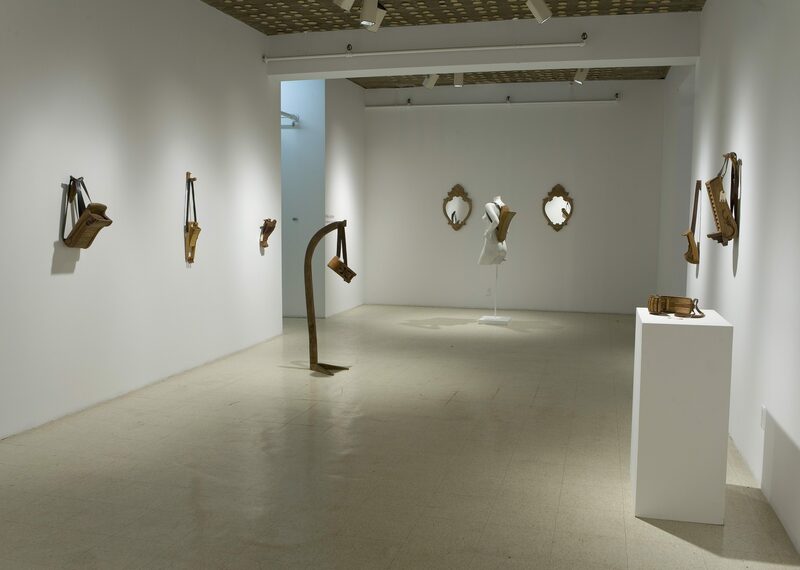 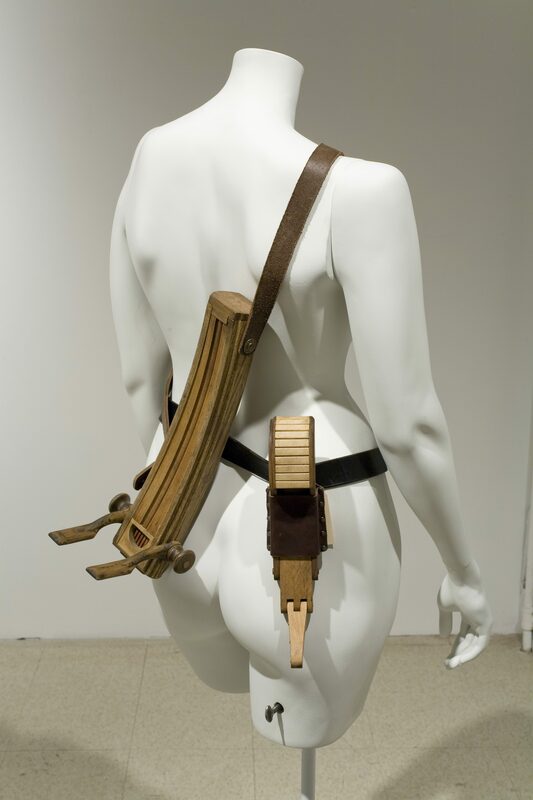 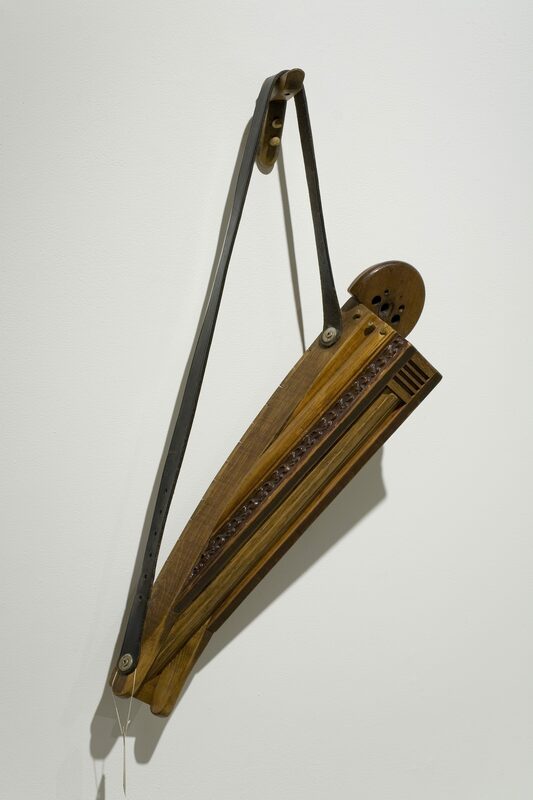 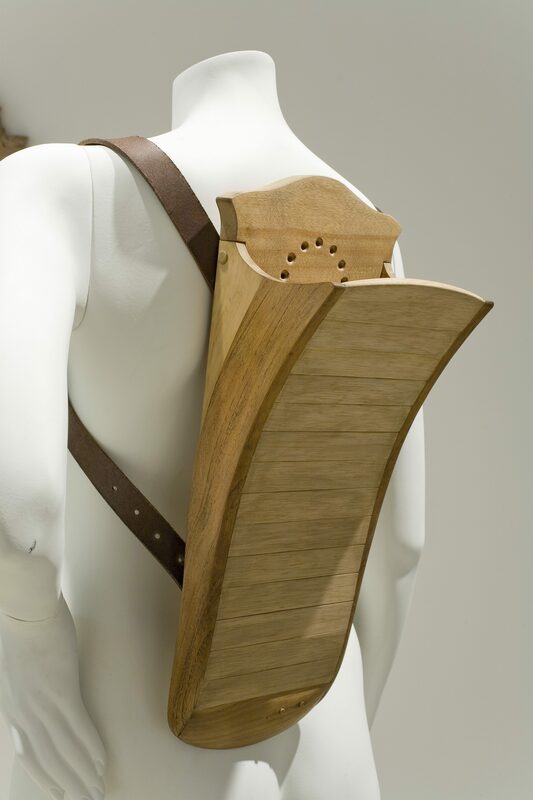 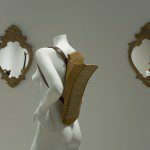 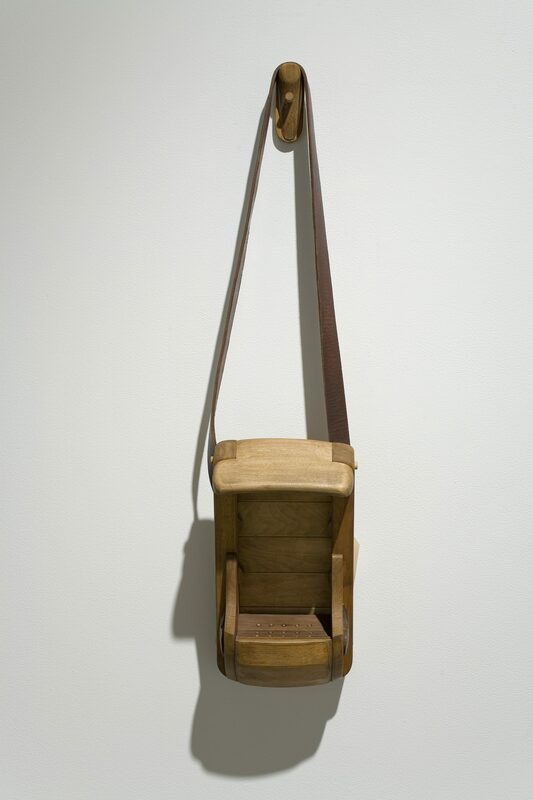 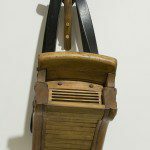 Prêt-à-porter features a series of sculptures carefully constructed from found pieces of wood and attached to leather strapping to resemble back packs, holsters, portable stools, even musical instruments. 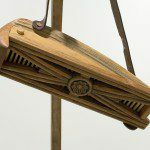 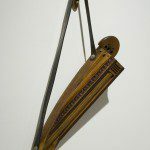 Each object incorporates the decorative wood characteristics of antique furniture presenting a traditional domestic aesthetic with the finish itself giving the appearance of an elaborate old-world object. 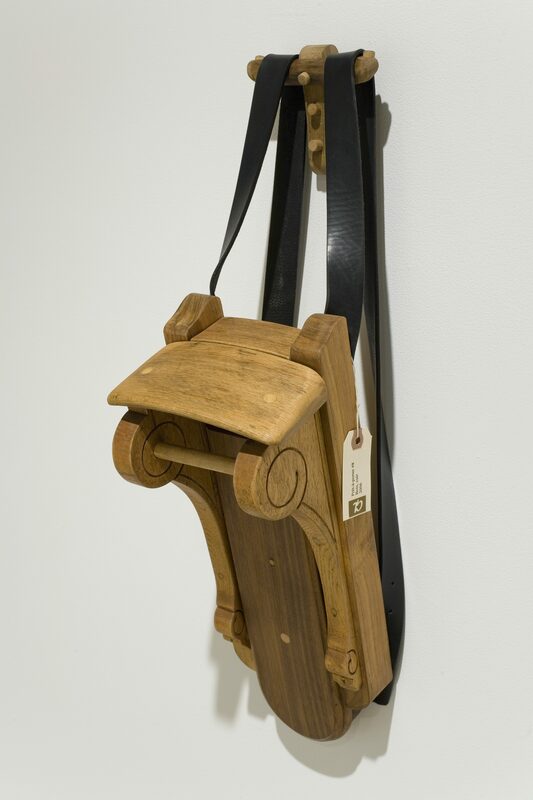 Yet, despite each object’s similarity to something one might use, Lachapelle parodies the frivolity of the art work by intentionally evading the its potential for utility. 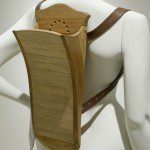 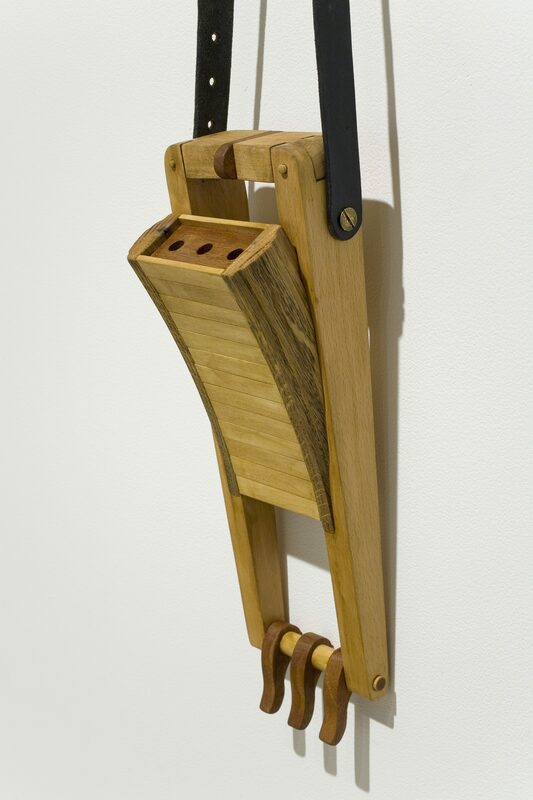 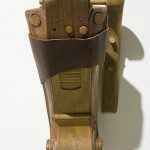 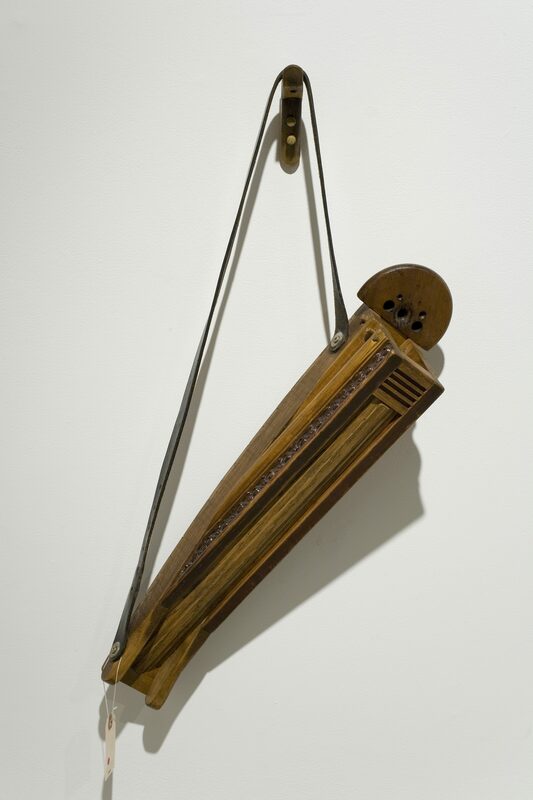 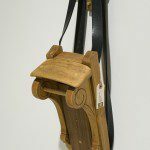 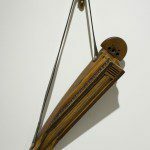 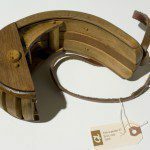 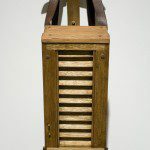 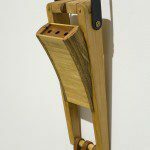 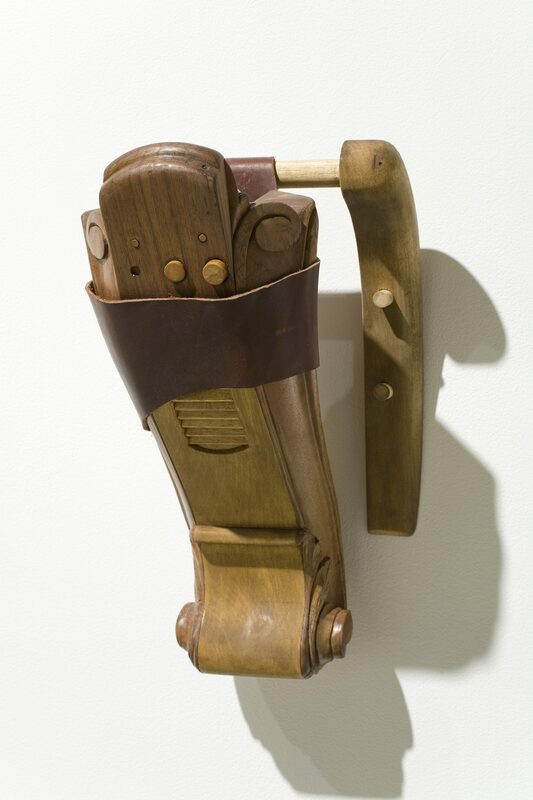 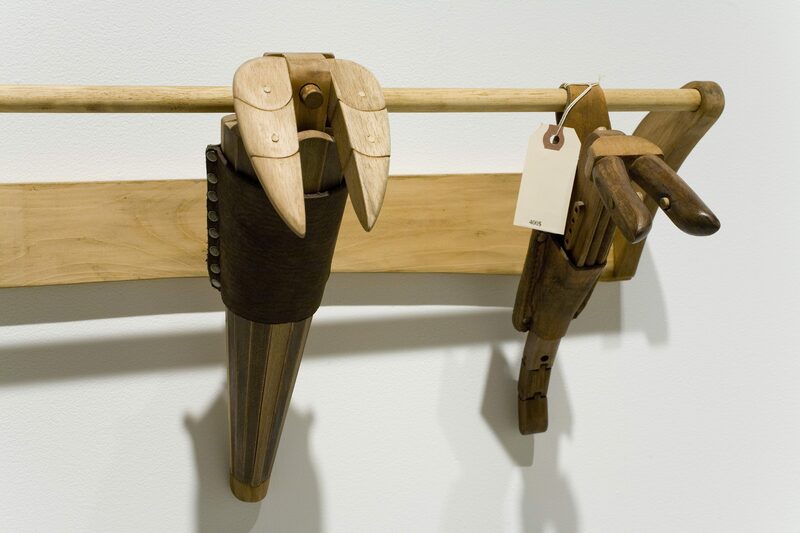 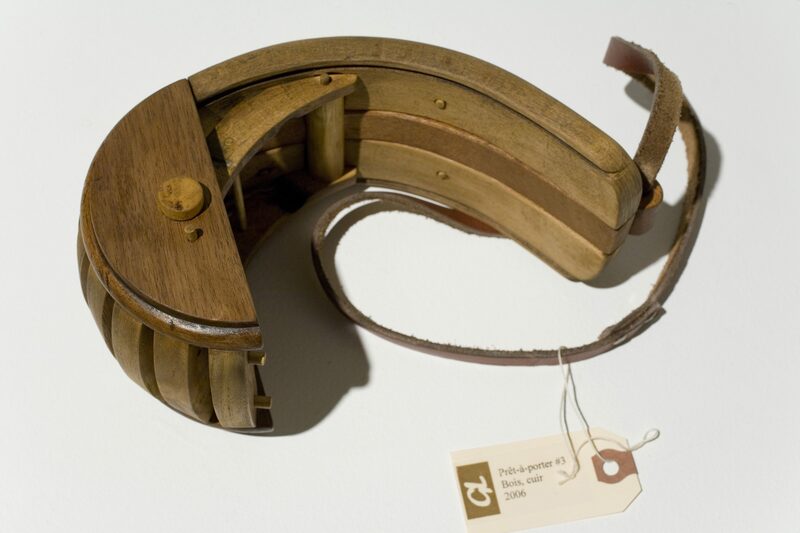 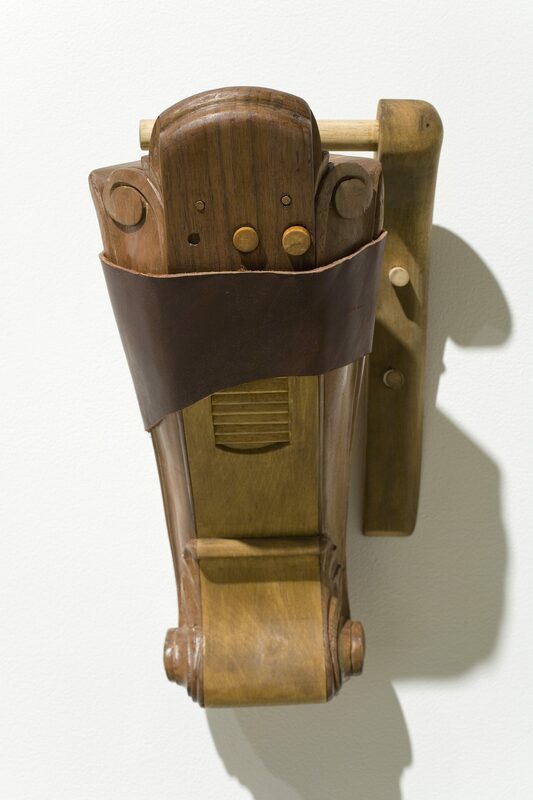 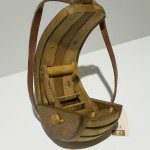 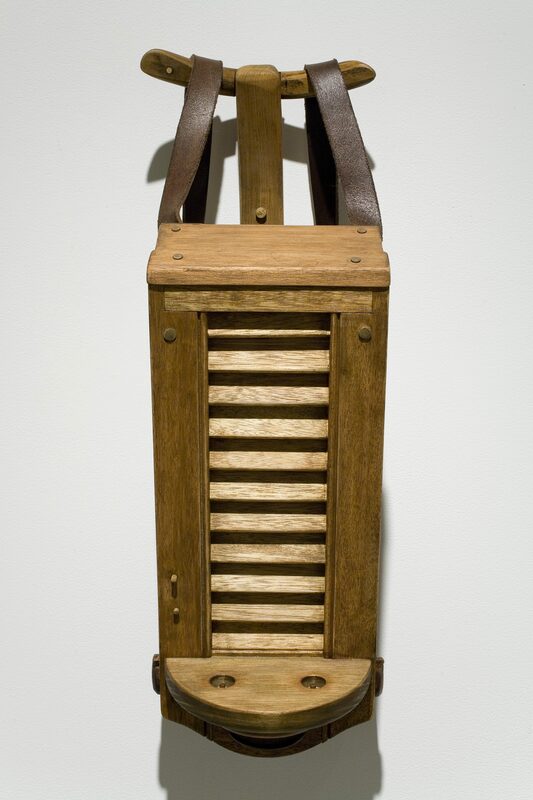 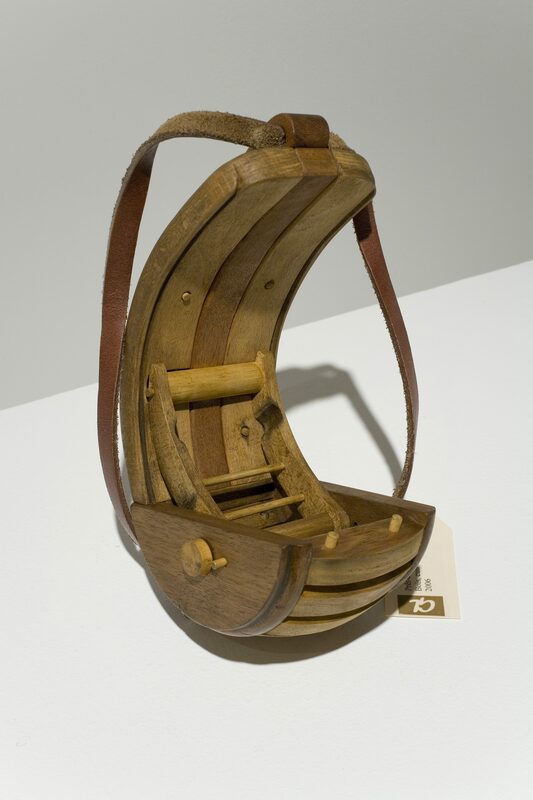 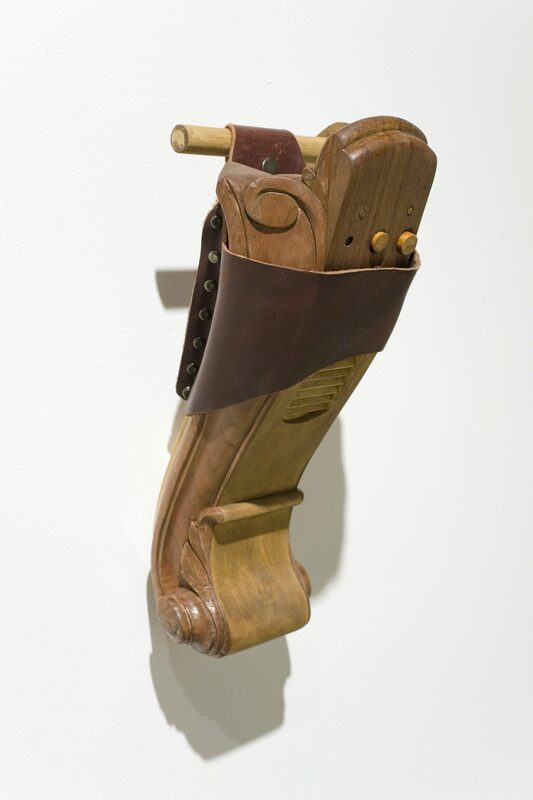 Within each piece there is an allusion to function: the object with shoulder straps could be a cabinet, its detailed circular edges, a makeshift seat; the holster strap could contain a weapon, a carving tool or a toy. 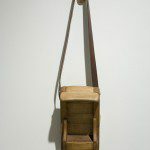 These possibilities become functions of fiction as each object eludes its task: if these are vessels there are no lids or openings, if these are seats they are imbalanced, the instrument is mute and the weapon, docile. 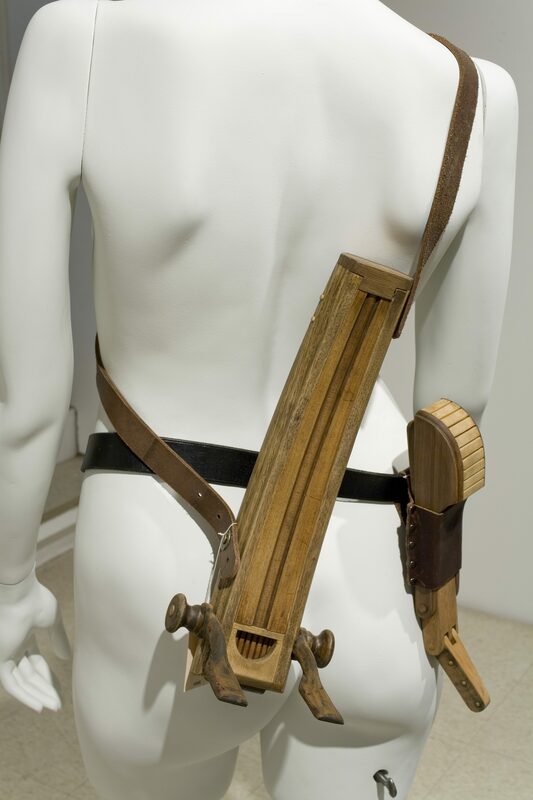 While Prêt-à-porter is a departure from the miniature worlds and impossible structures that characterized much of Lachapelle’s work, these new sculptures continue to imply the same potential for imagination as the small fantasies he creates in his other works. 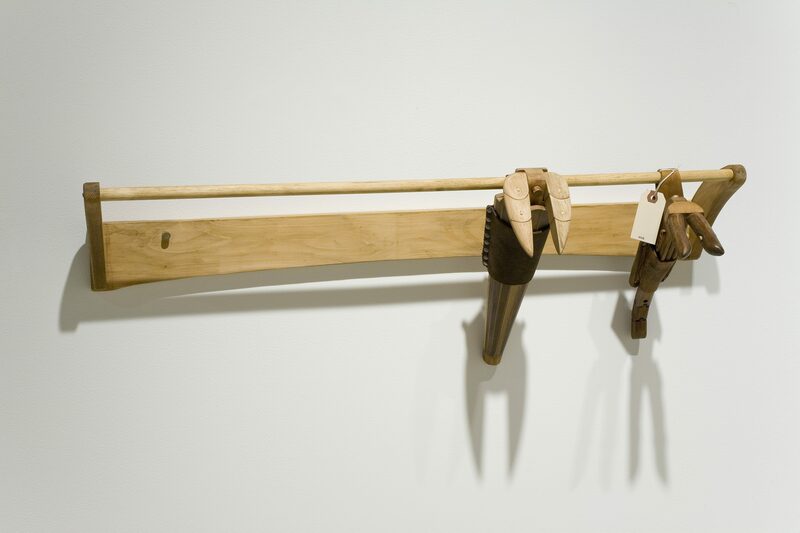 These objects at once embody utopic promises and experiments with failure. 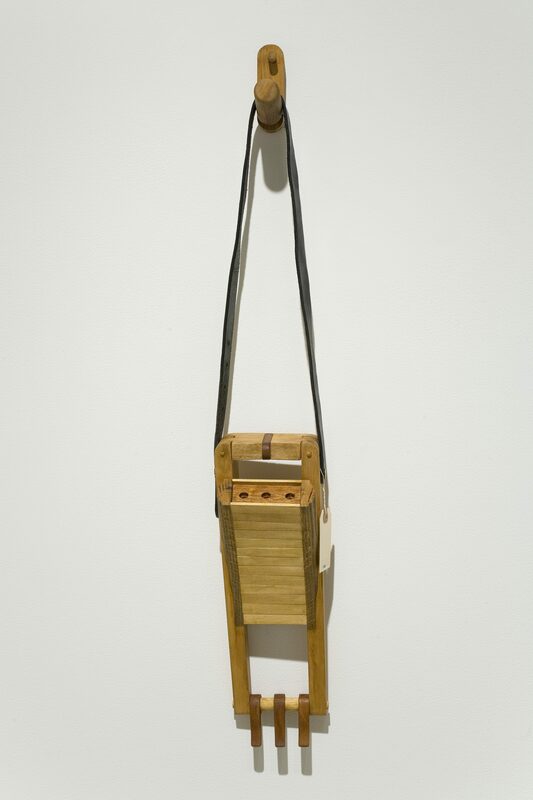 Like a game, Prêt-à-porter invites the viewer to participate in the production of the art object. 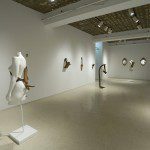 The wearability of the sculptures presents the possibility of a performative relationship, where the viewer is transformed into a participant responsible for navigating the reception of the work. 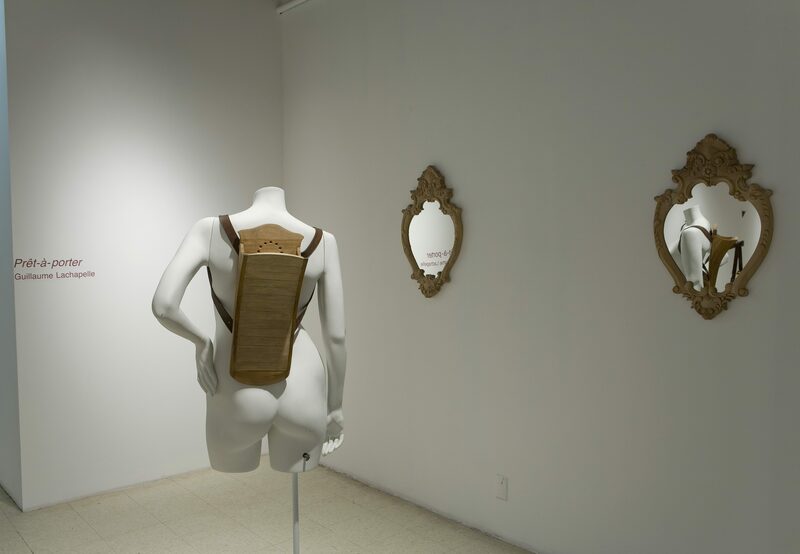 As a mobile mediator, the viewer, or wearer, ultimately becomes an integral part of the effect of display, providing a personal narrative of the object for curious onlookers. 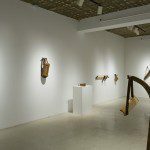 As objects located beyond installation on the gallery wall, these sculptures become fictional interventions into the everyday. 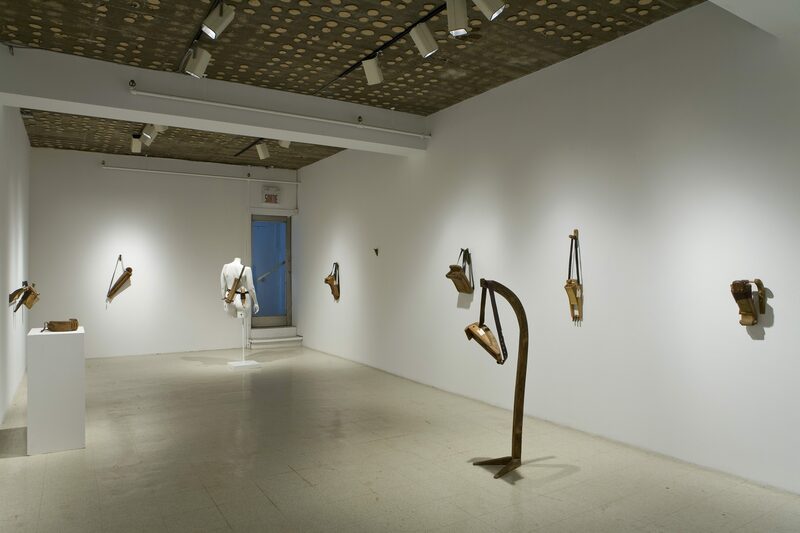 The focus on imagination and narrative potential that is so central to Lachapelle’s work here transitions from the gallery into public space. 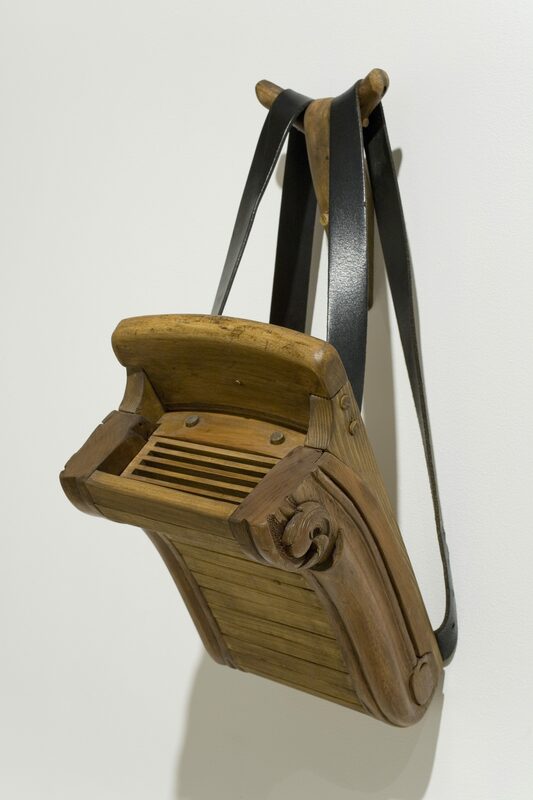 The viewer’s impression of the objects become aspirations for their function, imposed narratives of almost, left slightly twisted by Lachapelle’s brooding reference to fantastical worlds where bridges go nowhere and portable cabinets of curiosity retain their mystery within sealed and hollow interiors.